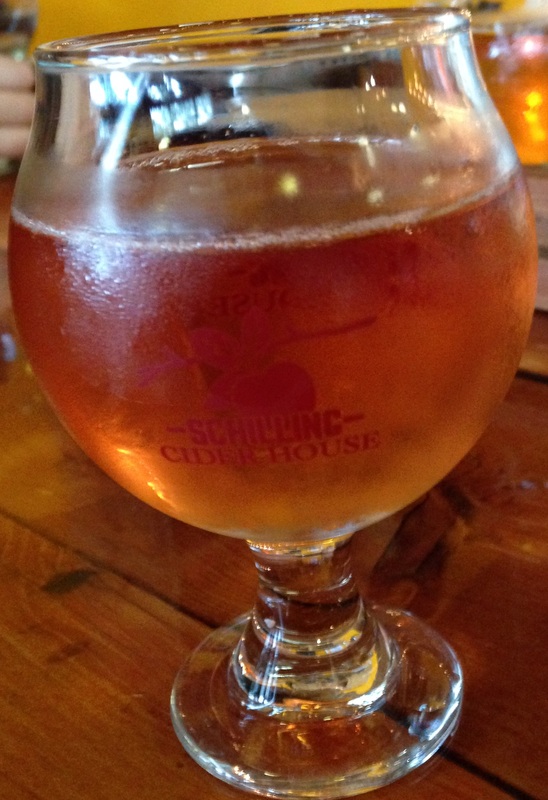 Tasting notes from my ninth visit to the Schilling Cider House in the Fremont neighborhood of Seattle WA. Check out my past posts here. I hadn’t thought I’d have time for another visit in December, but managed to fit it into my schedule. I was there for a Finnriver Bingo event, although I didn’t have much interest in the actual game & prizes, just used it as an excuse to go. The event was a packed house! There were six Finnriver ciders on tap: Habanero, Black Currant, Barrel in the Forest, Cranberry Rosehip, Fresh Hopped, and Pear (all of which I’ve had except Fresh Hopped). I started with a flight of six ciders. Blue Mountain Estate Winesap, 6.75% ABV, Milton-Freewater OR: This is a single varietal made with Winesap apples which Blue Mountain sells year round. Nearly clear. Tart, dry, and slightly funky smell. Dry to semi-dry. Moderate tartness and acidity. Mild bitterness. Very mild tannins. Hint of funk. Slight floral and oak notes. Light bodied. Moderate to long finish. I thought this was a basic dry & tart cider, and pretty low on flavor. Seattle Cider Oaked Maple, 6.9% ABV, Seattle WA: This is one of Seattle Cider’s winter seasonals (they also did a Cranberry cider this year). I couldn’t remember if I had tried this before, but I’m leaning towards yes. Dark straw yellow hue. Smells of sweet maple and oak. Semi-dry. Moderate acidity. Mild tartness. Light bodied. Very light oak and light maple flavor. Quick finish. I thought this was pretty good, but I would have liked more flavor. Finnriver Barrel in the Forest, 6.5% ABV, Chimacum WA: This is a limited release of a barrel aged version of Finnriver’s Forest Ginger cider (which I haven’t tried). I usually don’t like ginger, but this sounded interesting. Smells of sweet ginger. Semi-sweet. Light oak notes. Very mild ginger notes, much less than most ginger ciders (which usually seem to hit me at the back of the throat and linger). Low acidity, tartness, and bitterness. Light bodied. Moderate length finish. The ginger flavor however increased as it warmed up. This paired well with the Thai food I had for dinner. Overall I didn’t mind this one, despite the ginger, but probably wouldn’t get it again. 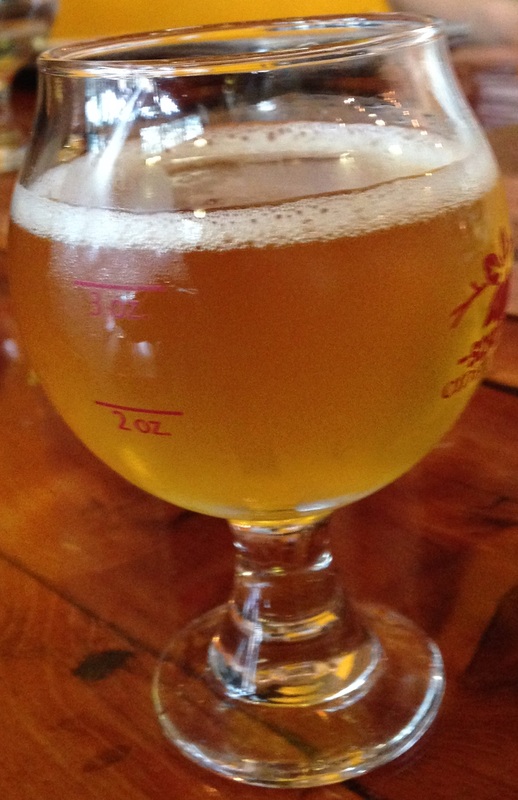 Locust Ciderworks Pumpkin, 5.0% ABV, Woodinville WA: This is a seasonal release from Locust, apparently draft-only. Hazy pumpkin orange-yellow hue. Smells of sweet pumpkin spice. Very sweet. Mild pumpkin and spice flavors, but overall very full flavored. Low acidity and tartness. Full bodied. Moderate length finish. I really liked this (even though I usually don’t go for pumpkin or spice), except it was too sweet for my liking, so not something I could have a pint of. E.Z. 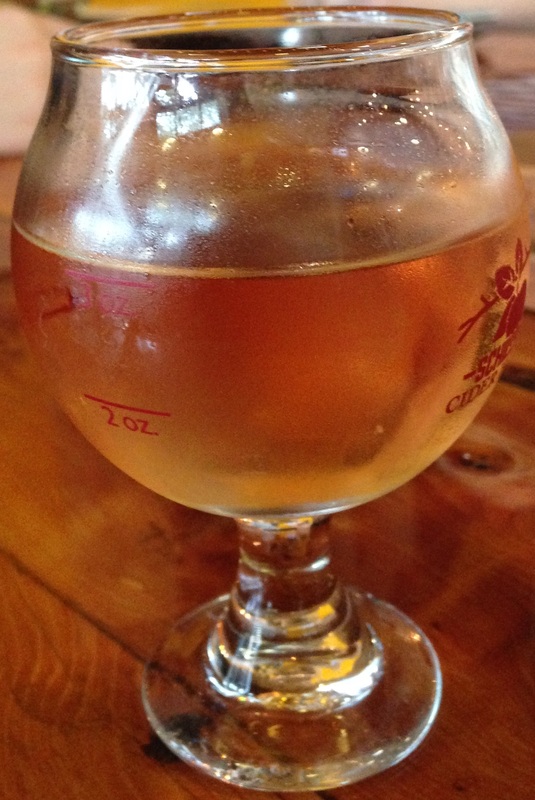 Orchards Semi-Dry, 6.9% ABV, Salem OR: This is a regular release cider from E.Z. Orchards which uses French bittersweet apples. After ordering this I remembered I had tried it before, at Cider Summit Seattle 2015. Light amber. Smells slightly rich. Semi-dry. Herbal notes. Very light boded. Low tannins and tartness. Low to moderate acidity. Quick finish. Overall mildly flavored. It tasted a bit off, and I wondered if the tap line could have used more flushing. I also liked it much better at Cider Summit. Different batches can turn out much differently. Grizzly Ciderworks Pomnivore on Nitro, 6.7% ABV, Woodinville WA: This is a tap-only release from Grizzly. Light ruby red. On the drier side of semi-sweet. Low acidity and tartness. Moderately flavored. Quick finish. I liked the pomegranate flavor without too much tartness like many pomegranate ciders have. I met Nathan from Cider Chronicles (we just happened to sit next to each other at the bar! ), who was awesome enough to share bottle pours of a couple ciders with me. He said Sea Cider Wassail, J.K.’s Scrumpy Winterruption, and Elemental Seasonal Spiced Apple were his three favorite seasonal ciders, although Reverend Nat’s Winter Abbey Spiced may be replacing J.K.’s Scrumpy Winterruption in his cue. I haven’t seen Rev Nat’s Winter Abbey, but picked up a bottle of Elemental Spiced, and tried the other two. 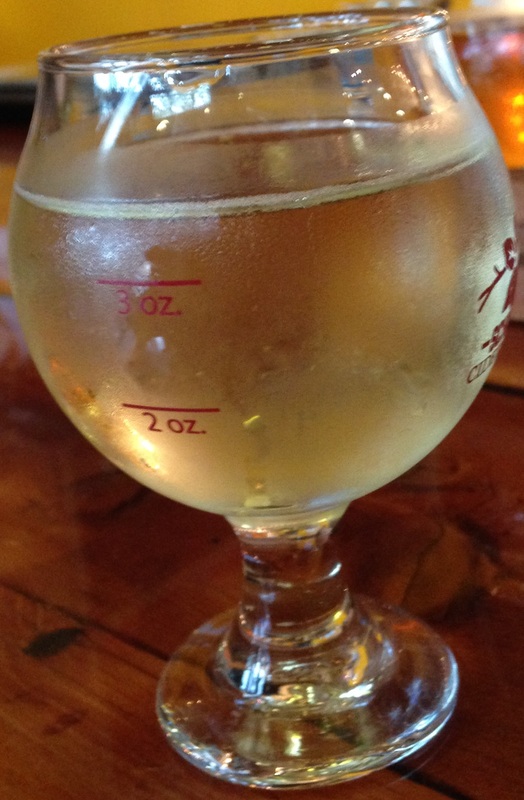 Sea Cider Wassail, 14% ABV, Saanichton BC Canada: This is Sea Cider’s winter seasonal. Rich amber-orange hue. Smells like orange and holiday spices. Semi-dry. Well-hidden ABV! Low acidity, tartness, and bitterness. The orange and spice notes continued into the flavor. Rich and full-flavored. Medium bodied. Moderate length finish with lots of heat. I liked this a bit more as it warmed up from fridge temperature. Overall this was enjoyable, but I like their Prohibition best. 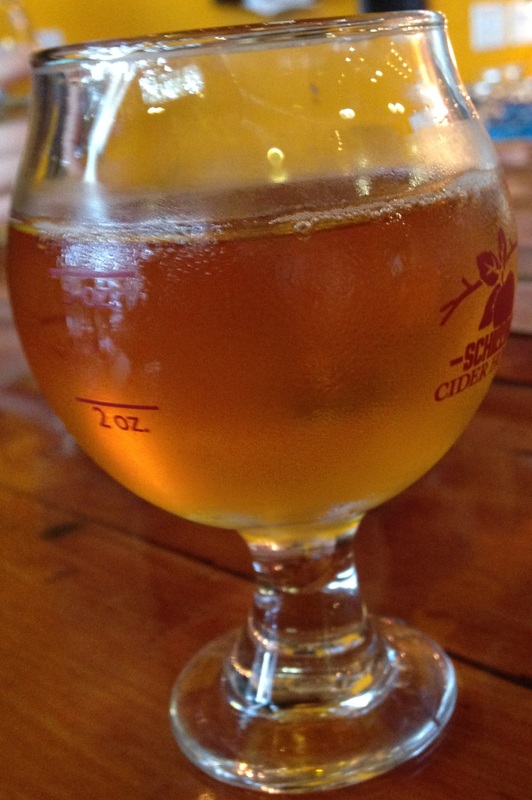 J.K.’s Scrumpy Cuvee Winterruption, 6.9% ABV, Flushing MI: This is J.K. Scrumpy’s winter seasonal. Very sweet. Honey, orange, and mild spice notes. Mild acidity and tartness. Moderate to full bodied. Apparently this cider usually has much more spice. It was very easy drinking, between the sweetness and low ABV. Overall I found it ok.
Another trip to the Schilling Cider House! I always have a blast (especially now that Sarah from Cider Log works there), and its kinda on my way home, and pretty affordable for a cider flight, so I make time for it when I can. I had barely sat down this time when Sarah asked my opinion on the sweetness level of Cockrell’s Valley Red (raspberry) they had just tapped (as they color code the tap list by sweetness level). My vote was semi-sweet. I actually tried that one at the Seattle Cider tasting room (The Woods) awhile back. Bright cherry-pink hue. Semi-sweet. Nicely balanced tart-sweet, The raspberry comes across with a nice bite, and is easily noticeable, but not overpowering. Then, I ordered a flight. It actually wasn’t too difficult to find 6 I hadn’t tried before, as they have 32 cider taps. Made from Wickson Crabapples and Nehou English Bittersweets, wild fermented. Semi-dry to Dry. Orangeish hue. Lots of crabbapple flavor and heavy tannins. Richer but light bodied. Slight funk. Not too much bitterness. Nice tang. Quite tasty, my favorite Wandering Aengus so far by far (usually not a big fan of them or their subsidiary Anthem). Reminds me of English cider. Apparently the name was because a bird made a nest on top of the tank, so they decided to name whatever cider they made a variation on bird. First time I’ve tried Jester & Judge, although I have a bottle of their cider in the fridge to try. They are a newish cidery out of Stevenson WA. Semi-dry. Orange/pink hue. Very very mild cherry. Some tartness. Overall kinda blah. I’d call it Hint of Cherry, not Sharp Cherry lol. I guess I’m just a fan of bolder flavor. By the way, my favorite cherry cider so far is made by Washington Gold, and has a lovely bold real tart cherry flavor. Second time I’ve tried Blue Mountain (only tried their Peach before). Semi-dry. Floral scent. Kinda watered down tasting / mildly flavored. Some tartness and some bitterness. Very mild tannins. Floral and citrus notes. Easy drinking and I think this would be widely appealing. Overall kinda average. French cidre! Semi-sweet. Nice richer flavor with mild tannins. I pick up some apple skin type flavor with this one, and its a bit larger bodied than some other French ciders I’ve had. Overall quite good, but as far as French ciders go, I prefer Dan Armor, which I found to be more flavorful. They carry this in bottles at the Schilling Cider House by the way. I’ve heard of this cidery from Ontario Canada, but hadn’t had a chance to try their cider. On the sweeter side of semi-dry. Plain yeasty apple scent. Some tartness, bitterness, and acidity, but rather mild. A rather basic cider without much flavor, but I don’t really have any complaints about it either. Well-hidden ABV. I’ve been wanting to try Doc’s. Sarah recommends their Sour Cherry, but I haven’t seen it yet. This one was weird…I picked up some saltiness. Maybe from the tap line? It also unfortunately didn’t take well to the Nitro (there wasn’t any noticeable Nitro influence; typically the ciders get really foamy & smooth). Semi-sweet. Nicely balanced tart-sweet raspberry. Smelled better than it tasted though. I’ll have to give them another try. Overall: The only ciders I truly enjoyed from my flight were the Wandering Aengus (oddly enough) and Le Brun. I kinda wished I had got a flight of the ciders I knew I liked that they had on tap, but I’m a sucker for trying new things, especially ciders, and especially when I haven’t tried anything from that cidery. While I was there they also put together a very unique Randall using Schilling Oak Aged cider, mushrooms, walnuts, and black olives! The olives cam through most in the scent. The taste was quite earthy with some funk, and a bit chunky honestly (I got the first pour I think). It wasn’t as bad as it sounds though, although a couple sips was plenty. Looks like Friday afternoons are their typical Randall time, as the same thing happened during my previous visit. Sarah also shared some of a bottle of Aspall Dry with me! This was the very first Aspall variety I had (at the Seattle International Beerfest; see my post here), and is quite excellent. Its an awesomely crisp apple-forward semi-dry cider. I haven’t been disappointed by any Aspall variety yet, and am looking forward to trying the bottle of Imperial I have at home. 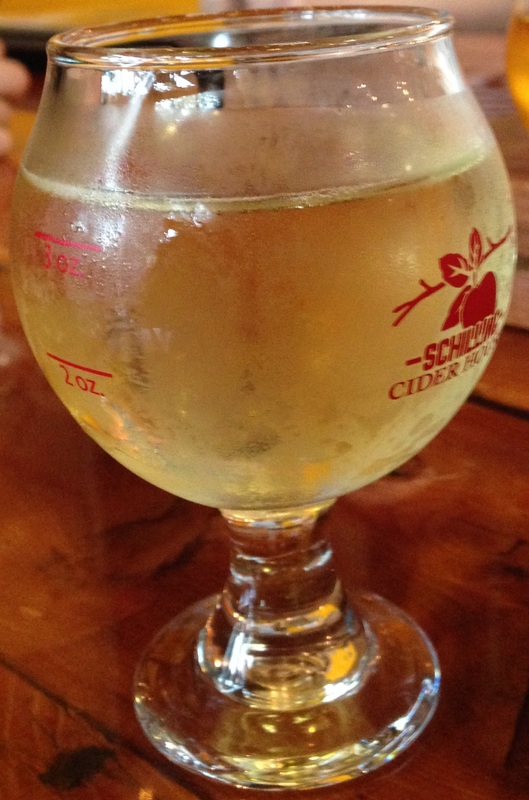 So, all in all, obviously I highly recommend the Schilling Cider House! By the way, the Schilling Cider House has a monthly potluck. The next one is on Thursday October 22 from 5-9pm, and being called Dude…Sweet, with a theme of sweeter ciders, and asking folks to bring in sweet treats to share. There will even be a new Schilling release!